#anonsec : Anonymous Hackers guide how to Mesh Network ! 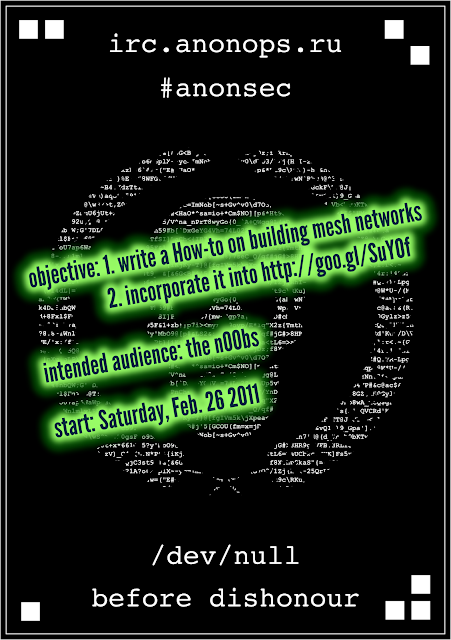 The idea is to write a how-to on building mesh networks. The n00bs must understand it. Mesh networks are usefull, as they cannot be censored nor shut down. Later on that How-to can become part of Anonymous' uber-secret handbook regarding safety. Version 0.2.0, a downloadable .pdf, can be found there http://goo.gl/SuY0f. Join irc.anonops.ru #anonsec where you find the mesh pad link in the /topic.